Chhath, also called Dala Chhath - is an ancient and major festival in Bihar, and is celebrated twice a year: once in the summers, called the Chaiti Chhath, and once around a week after Deepawali, called the Kartik Chhath. The latter is more popular because winters are the usual festive season in North India, and Chhath being an ardous observance requiring the worshippers to fast without water for more than 24 hours, is easier to do in the Indian winters. Chhath is the worship of the Sun God. Wherever people from Bihar have migrated, they have taken with them the tradition of Chhath. This is a ritual bathing festival that follows a period of abstenance and ritual segregation of the worshipper from the main household for two days. On the eve of Chhath, houses are scrupulously cleaned and so are the surroundings. The ritual bathing and worship of the Sun God takes place, performed twice: once in the evening and once on the crack of the dawn, usually on the banks of a flowing river, or a common large water body. The occasion is almost a carnival, and besides every worshipper, usually women, who are mostly the main ladies of the household, there are numerous participants and onlookers, all willing to help and receive the blessings of the worshipper. Ritual rendition of regional folk songs, carried on through oral transmission from mothers and mothers-in-law to daughters and daughters-in-law, are sung on this occasion for several days on the go. These songs are a great mirror of the culture, social structure, mythology and history of Bihar and Uttar Pradesh. Nowadays, modern Chhath songs, largely Bollywood filmy remixes have caught on, but the old tradition still goes strong. Chhath, in absence of proper administrative arrangements, however, leads to some serious problems of traffic congestion, waterbody pollution and vandalism on several Bihari towns. However, Chhath being celebrated at the crack of the dawn on a river bank is a beautiful, elating spiritual experience connecting the modern Indian to his ancient cultural roots. Chhath is celebrated around a week after the festival of Diwali. However, the two festivals are not connected, mythologically speaking. While Diwali celebrates the return of Lord Rama after the battle with the demon king Ravana, Chhath is an ancient festival supposedly started by the King of Anga Desh (modern Bhagalpur region in Buhar) named Karna. Karna is a powerful character in the epic Mahabharata. Chhath is also celebrated by a great number of people in Eastern Uttar Pradesh. Teej and Chitragupta Puja are other local festivals celebrated with fervour in Bihar. Among ritual observances, the month long Shravani Mela held along a 108 kilometre route linking the towns of Sultanganj and Deoghar [now in Jharkhand state] is of great significance. Shravani Mela is organised every year in the Hindu month of Shravan, that is the lunar month of July-August. Pilgrims, known as kanwarias, wear saffron coloured clothes and collect water from a sacred Ghat [river bank] at Sultanganj, walking the 108 km stretch barefooted to the town of Deogarh to bathe a sacred Shiva-linga [sacred rock]. The observance draws thousands of people to the town of DeogharIndia. Bihula-Bishari Puja of Anga region also is a great festival of Bihar. The Sonepur cattle fair is a month long event starting approximately half a month after Deepawali and is considered the largest cattle fair in Asia. It is held on the banks of the SoneRiver in the town of Sonepur. The constraints of the changing times and new laws governing the sale of animals and prohibiting the trafficking in exotic birds and beasts have eroded the once-upon -a-time magic of the fair. * Apart from Chhath, all major festivals of India are celebrated in Bihar, such as Makar Sankranti, Saraswati Puja, Holi, Eid-ul-Fitr, Eid-ul-Adha (often pronounced Eid-uz-Zoha in South Asia), Muharram, Ram Navami, Rath yatra, Rakhi, Maha Shivaratri, Durga Puja, Divali, Laxmi Puja, Christmas, Mahavir Jayanti, Buddha Purnima, and several other local festivals as well. Bihar has a very old tradition of beautiful folk songs, sung during important family occasions, such as marriage, birth ceremonies, festivals, etc. They are sung mainly in group settings without the help of many musical instruments, though Dholak,Bansuri , and occasionally Tabla and Harmonium are used. Bihar also has a tradition of lively Holi songs known as 'Phagua', filled with fun rhythms. During the 19th century, when the condition of Bihar worsened under the British misrule, many Biharis had to migrate as indentured labourers to West Indian islands, Fiji, and Mauritius. During this time many sad plays and songs called biraha became very popular, in the Bhojpur area. Dramas on that theme continue to be popular in the theaters of Patna. Dance forms of Bihar are another expression of rich traditions and ethnic identity. There are several folk dance forms that can keep one enthralled, such as dhobi nach, jhumarnach, manjhi, gondnach, jitiyanach, more morni, dom-domin, bhuiababa, rah baba, kathghorwa nach, jat jatin, launda nach, bamar nach, jharni, jhijhia, natua nach, bidapad nach, sohrai nach, and gond nach. Hindi (Official language of State), Urdu-(2nd official language of State government), Angika, Bhojpuri, Maithili, Bangla and Magadhi (Magahi) are the major languages spoken in Bihar. Angika is the only one of the languages which can be used in the Google Search Engine; Google-Angika has been available since 2004. The oldest poetry of the Hindi language (e.g., poetries written by Saraha, also known by the name Sarahapa, were written in the Angika language during the 8th century. Bihar has produced a number of writers of Hindi, including Raja Radhika Raman Singh, Shiva Pujan Sahay, Divakar Prasad Vidyarthy, Ramdhari Singh 'Dinkar', Ram Briksha Benipuri, Phanishwar Nath 'Renu' and Baba Nagarjun. Mahapandit Rahul Sankrityayan, the great writer and Buddhist scholar, was born in U.P. but spent his life in the land of Lord Buddha, i.e., Bihar. Different regional languages also have produced some prominent poets and authors. Devaki Nandan Khatri, who rose to fame at the beginning of the 20th century on account of his novels such as Chandrakanta and Chandrakanta Santati, was born in Muzaffarpur, Bihar. Vidyapati Thakur is the most renowned poet of Maithili (c. 14-15th century). 1. Acceptance of representations and replies thereto. 2. Acceptance of documents by the Registration Offices. 3. Publication of important rules, regulations, etc. 4. Issue of orders and notifications of public interest. 5. Publication of important Government documents. Theatre is another form in which the Bihari culture expresses itself. Some forms of theater with rich traditions are Reshma-Chuharmal, Bihula-Bisahari, Bahura-Gorin, Raja Salhesh, Sama Chakeva, and Dom Kach. All of these theatre forms originate in the Anga or Ang area of Bihar. Bihar has a robust cinema industry for the Bhojpuri language. There is also a small Maithili and Angika film industry. First Bhojpuri Film was Ganga Maiya Tohe Piyari Chadaibo. Nadiya Ke Par is the most famous Bhojpuri movie till date. First Maithili Film was Kanyadan (released in 1965 & Directed by Phani Majumdar)had a significant portion in Maithili language. The first Angika language film is ready for release. The name of this film is "Khagaria Vali Bhouji".Kunal Baikunth Singh is the Producer, Director and Hero of this Film. Heroine is Neetu Singh. A Cassette of this Angika film has been already released months back. The film is scheduled to be released on 20th April,2007.Film Tisri Kasam (Based on Renu's Mare Gaye Gulpham and directed By Shailendra & acted by legendry Raj Kapoor and Vahida Rahman), Parinita(Old), and Gangajal (Produced by Prakash Jha) had significant portions in Angika Language. The cuisine of the Bihar upper and middle classes is predominantly vegetarian, though the lower classes which form a significant population are traditional meat eaters with various fowl, pigs, small animals, snails, and field rats being part of their day-to-day existence. However, unlike Gujarat or some communities of the South, meat is acceptable in the society of Bihar, as well, with even some sects of Brahmins such as the Mithila accepting fish as a food item. Traditional [high caste] Bihar society did not eat eggs and chicken, although other types of birds and fowls were acceptable. The staple food is bhat, dal, roti, tarkari and achar. It is prepared from rice, lentils, wheat flour, vegetables, and pickle. The traditional cooking medium is mustard oil. Khichdi, a broth of rice and lentils seasoned with spices and served with several accompanying items, constitutes lthe mid-day meal for most Hindu Biharis on Saturdays. Chitba and Pitthow which are prepared basically from rice, are special foods of the Anga region. Tilba and Chewda of Katarni rice also are special preparations of Anga. Kadhi bari is a popular favorite and consists of fried soft dumplings made of besan (gram flour) that are cooked in a spicy gravy of yogurt and besan. This dish goes very well over plain rice. Bihar offers a large variety of sweet delicacies which, unlike those from Bengal, are mostly dry. These include Anarasa, Belgrami, Chena Murki, Motichoor ka Ladoo, Kala Jamun, Kesaria Peda, Khaja, Khurma, Khubi ka Lai, Laktho, Parwal ka Mithai, Pua & Mal Pua, Thekua, Murabba and Tilkut. 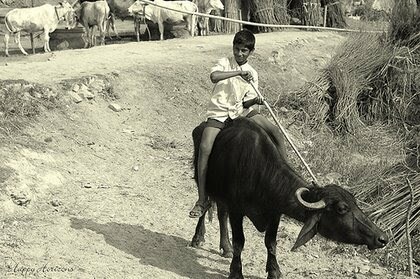 Many of these originate in towns in the vicinity of Patna. Several other traditional salted snacks and savouries popular in Bihar are Chiwra, Dhuska, Litti, Makhana and Sattu.